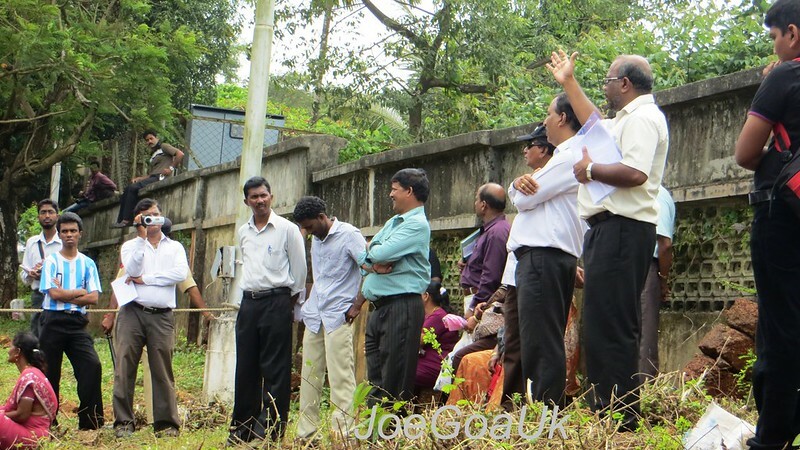 JoeGoaUk's Point of View: What's going on in Sanvordem Parish?? What's going on in Sanvordem Parish?? - Reinstatement of Fr. James Torres e Silva who was ealier relieved from the Church. 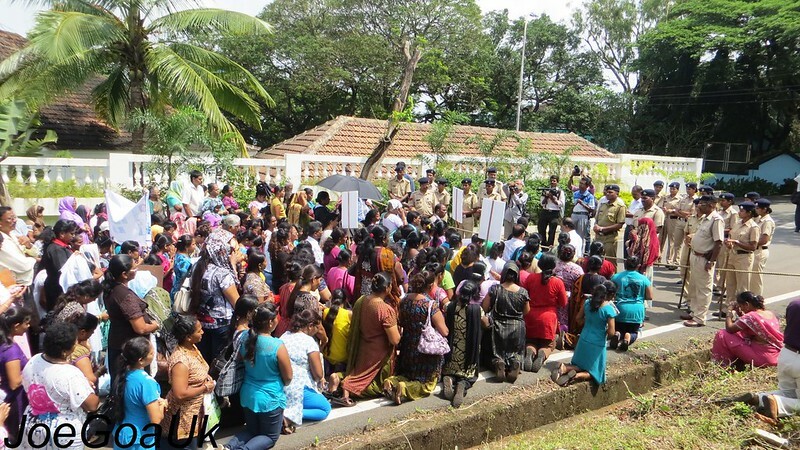 - If the demands are not met within 7 days, then the parishioners will resort to chain hunger strike infront of their parish church. 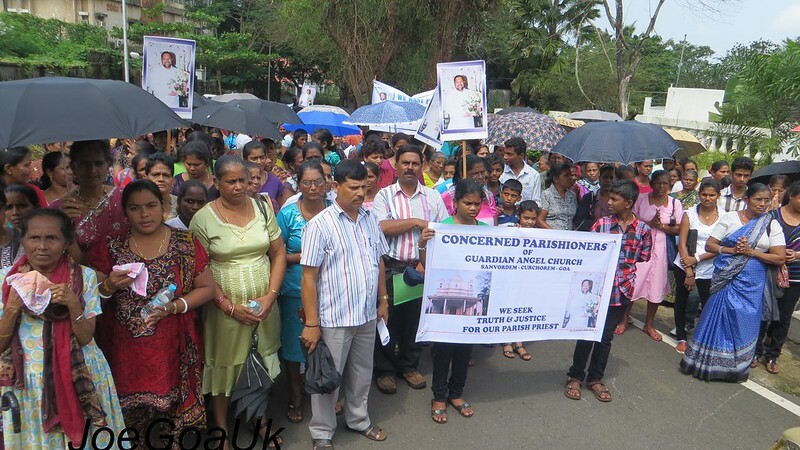 - In the event of shutting down of the Church by the authority, the present Fabrica Treasurer Agostine Pires and Member Lalita Mascarenhas along with the Diosocian committee who supported them will be solely responsible. Restricted Entry at the Main Palace gate. People asked why and who they wish to meet to. Full police bandobost, 4 big bus spotted. About 500 people who travelled 60 kms in 11 buses. Arrived at the palace around 10.55am but stopped 100 meters away. Police already barricaded the roads, traffic was diverted. The praying protesters seen singing hymns, saying Rosary kneeling down on the road. About 5 resolutions passed in one voice. The Protest march lead by Desmond Cardozo and William Fernandes who also made speeches. the actual grounds of misbehaviour. Church says the priest has resigned before going to US on health or personal grounds. Some parishioner say he was forced to resign. In the event of the Church is closed, there were some suggestions to bring in Bro. Domnic (of retreat fame). A 4 member delegation including Willy went to meet the Archbishop to hand over a singed memorandum at 12 noon. Desmond Cardozo, William Fernandes addressing..
What's the truth behind it? 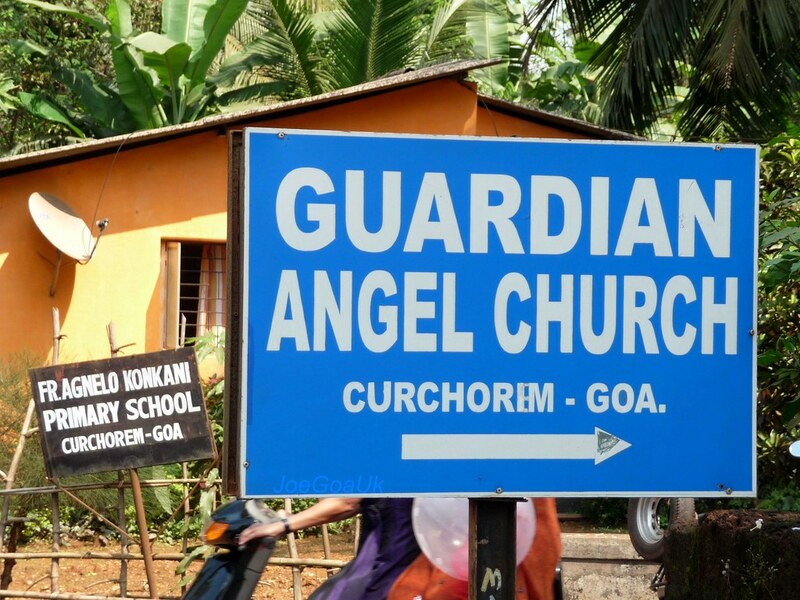 The Bishop is not the head of the Goa Church anymore? Fr. James earlier applied for permission to go to USA, Bishop granted him permission 27th June. Later on, Fr. James requested Bishop to relieve him from Sanvordem Parish on some personal grounds. Again, on August 1, Fr. James personally handed in his petition requesting to relieve him and the Bishop relieved him of his duties as on August 10, 2013 (at his own request). This note of clarification received from Bishop House late night of 2nd Oct (or 2.30am of 3/10/13 via email), upon request. On behalf of the Archbishop of Goa, the following clarification is being issued regarding the matter of the resignation of Fr. James Silva as Parish Priest of Guardian Angel Church, Sanvordem. 1. The matter of a priest’s appointment to any ecclesiastical post or his transfer thereof is exclusively of the competence of the local Bishop. 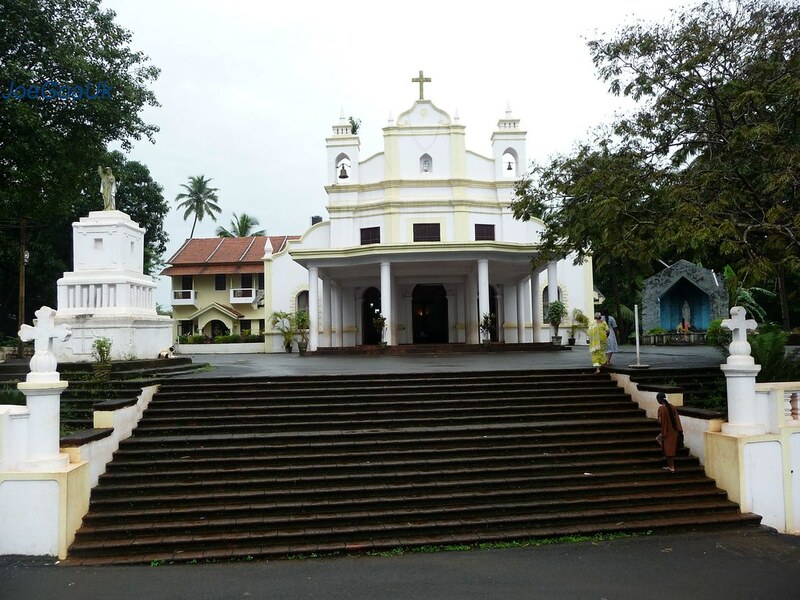 The Archbishop of Goa is therefore the only competent Authority to send a suitable priest to any parish in the Archdiocese or to transfer him from there, as per the needs of the Church. Consultation with the respective parishioners has never been part of the process. 2. The Bishop may also transfer a priest from time to time, considering the pastoral needs of each parish. 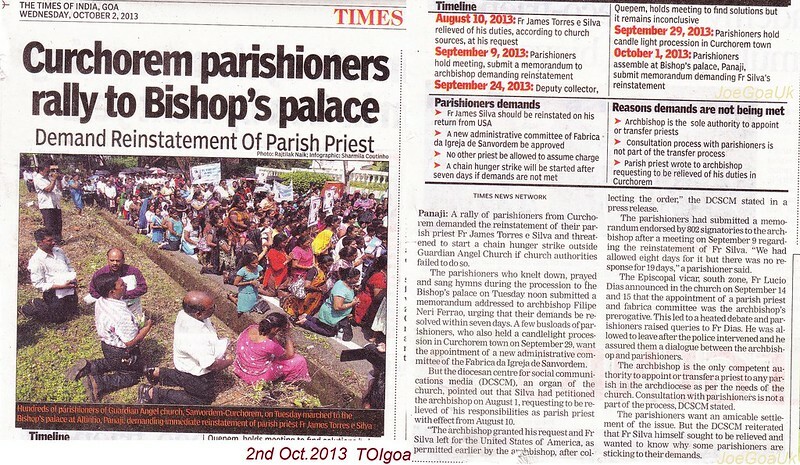 Conversely, the priest too may ask to be relieved of his duties, for personal reasons to be approved by the Bishop. a. Fr. James Silva approached the Archbishop in the month of July 2013 (without any prior appointment) and, across the table, revealed to him that he would like to be relieved of his responsibilities as Parish Priest of Sanvordem Church. The Archbishop tried to elicit the reasons for such a request. b. Subsequently, on August 1, 2013, Fr. 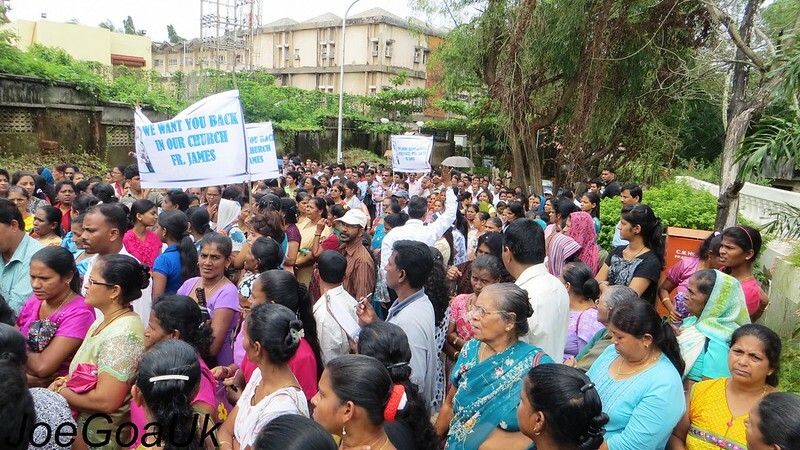 James submitted a written petition to the Archbishop, requesting to be relieved of his duties with effect from August 10, 2013 and stating the reasons for his request. c. After giving serious consideration to what was written by Fr. James, the Archbishop granted his request and relieved him of his duties with effect from August 10, 2013, as per the wish of the petitioner. Fr. James collected the relieving Order and went to the United States of America, for which he had already obtained prior permission from the Archbishop. d. Incidentally, it has come to our knowledge that the parishioners were made to believe that Fr. James was forced by the Archbishop to tender his resignation, if he wanted permission to go on vacation abroad. The fact is that the Archbishop had already granted him permission to go abroad on 27th June, 2013, while the request to be relieved came from Fr. James only on the 1st of August. e. It is also being disseminated in Sanvordem that the Order of the Archbishop amounts to Fr. James being divested from his priestly state. This is a false propaganda, since the Order of the Archbishop only states that Fr. 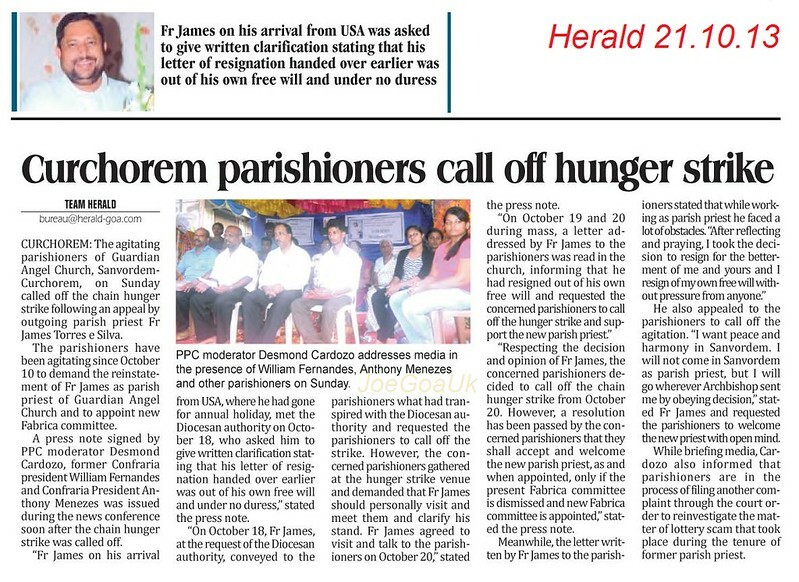 James ceases to be the Parish Priest of Sanvordem with effect from August 10, 2013.
f. It is clear that the announcement of this Order was not taken kindly by some of the parishioners of Sanvordem, who decided to hold a meeting in the compound of the Church, following which a memorandum addressed to the Archbishop was handed over at the Archbishop’s House. 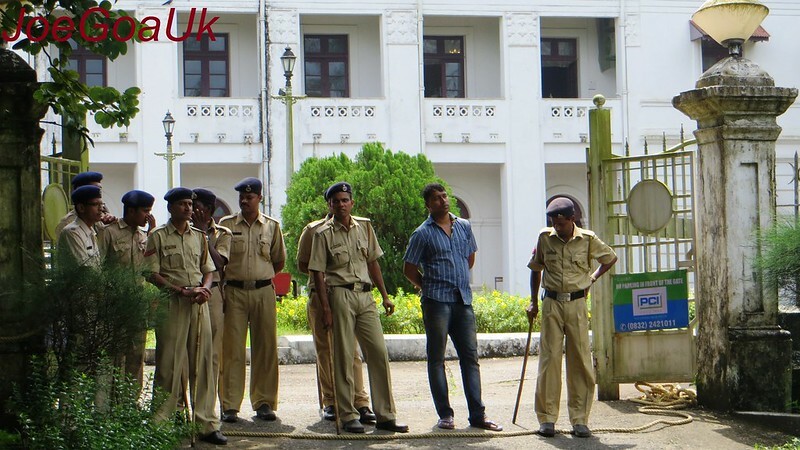 In that memorandum they even threatened that “if (their) demands are not met within a period of 8 days, the parishioners will march to the Archbishop’s House and hold a dharna and go on a chain hunger strike until the demands are fully met.” The memorandum is dated 9th September 2013.
g. Since the memorandum did not indicate any person who could be contacted, a response to this memorandum was communicated to the parishioners of Sanvordem through an announcement made during Saturday/Sunday Masses on 14th and 15th September, 2013. Besides conveying the response of the Archbishop to the memorandum, the purpose of this announcement was also to enlighten the parishioners concerning the mind and the norms of the Church with regard to the appointments/transfers of priests and appointments of the committees assisting the priests in the administration of the material assets of the Church. Both these points had been raised in the said memorandum. h. Fr. 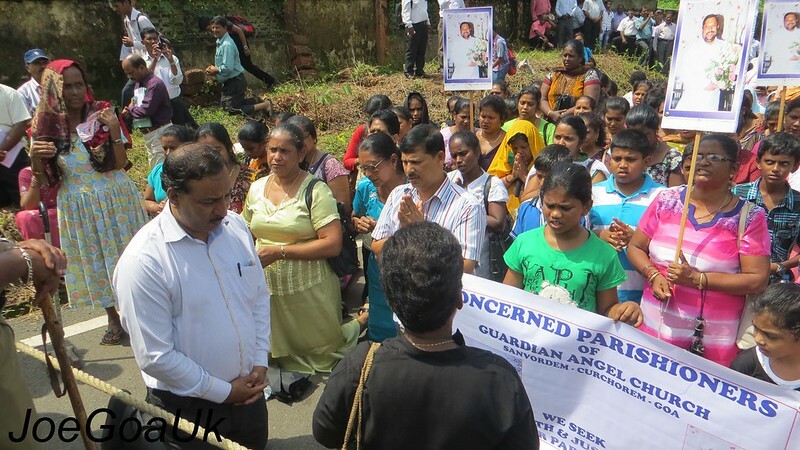 Lucio Dias, the Episcopal Vicar for the South Zone of Goa, was deputed as the Representative of the Archbishop to make the above mentioned announcement to the parishioners of Sanvordem. Incidentally, Fr. Dias has since been appointed also as a provisional In-Charge or Parochial Administrator of the Parish of Sanvordem. i. The announcement that the Episcopal Vicar read out ended with an appeal to the parishioners to accept the mind of the Church, to extend their willing collaboration to the new priest who would be assigned by the Archbishop to the parish of Sanvordem and to maintain peace and harmony in the parish. j. 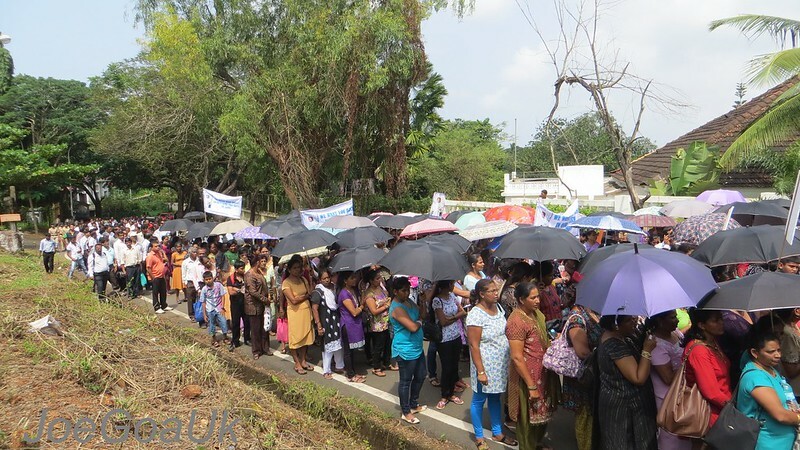 However, it is highly regretted that some of the parishioners gheraoed the official Representative of the Archbishop on the 15th of September, after Mass, insulting him and holding him hostage for almost three hours, thereby creating an unnecessary law and order situation. 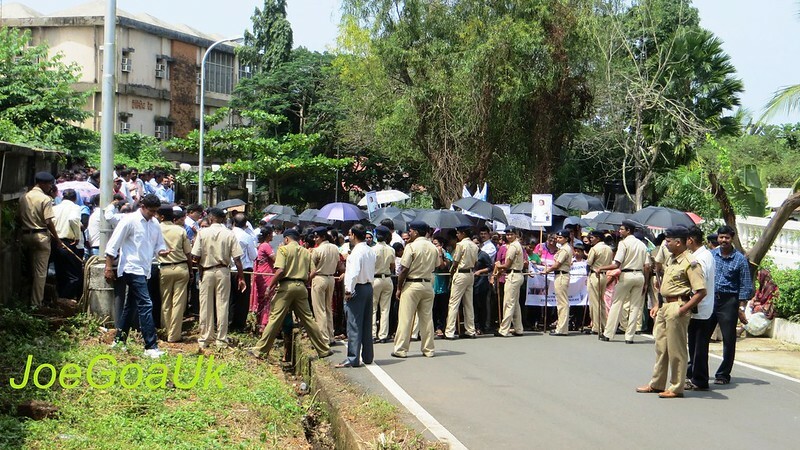 This was followed by frequent press statements, ending up today with a march to Archbishop’s House, in order to press for their demands. We fail to understand why some parishioners of Sanvordem have the above demands, while Fr. James himself sought to be relieved of his post out of his own free will. 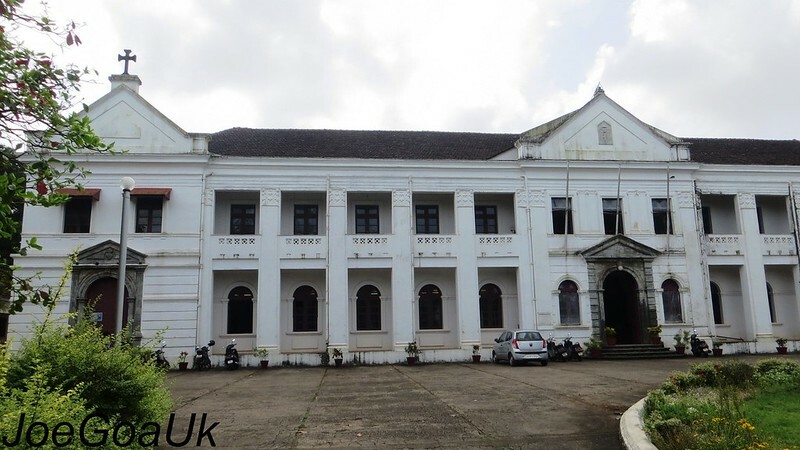 Archbishop’s House, Panjim, Goa, October 1, 2013.